Crock-Pot 4-Quart Slow Cooker Only $15.92 (Reg. $19.58)! 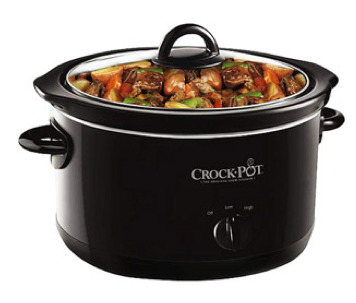 You are here: Home / Great Deals / Crock-Pot 4-Quart Slow Cooker Only $15.92 (Reg. $19.58)! Need a new slow cooker, or want to add one to your collection to make your weekly meals? Well, you’re in luck, because right now you can snag this awesome Crock-Pot 4-Quart Slow Cooker for Only $15.92 (Reg. $19.58) + FREE Store Pick Up with Site-To-Store Shipping!